Emergency Vape Stash Vol. 2 Strawberry Vanilla Custard 120ml.. Emergency Vape Stash Vol. 2 Pink Lemonade 120ml.. Emergency Vape Stash Vol. 2 Lemon Cheesecake 120ml.. Emergency Vape Stash Vol. 2 Caramel Green Apple 120ml.. Emergency Vape Stash Vol. 2 Blue Razz Slushie Ice 120ml.. Emergency Vape Stash BLUE RAZZ SLUSHIE 120ml.. Emergency Vape Stash BLUEBERRY CHEESECAKE 120ml.. 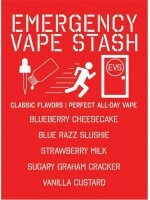 Emergency Vape Stash SUGARY GRAHAM CRACKER 120ml.. Emergency Vape Stash STRAWBERRY MILK 120ml.. Emergency Vape Stash VANILLA CUSTARD 120ml..